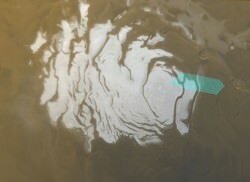 Scientists have spotted an underground reservoir near Mars’ south pole the size of Lake Superior… except that this lake is filled with frozen carbon dioxide – a.k.a. “dry ice”! A recent report by scientists at the Southwest Research Institute in Boulder, CO reveals variations in Mars’ axial tilt can change how much carbon dioxide gets released into the atmosphere, affecting factors from the stability of water on its surface to the power and frequency of dust storms. 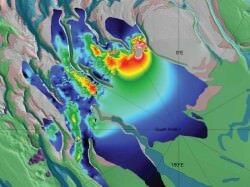 While scientists were aware of seasonal CO2 ice layers atop the water ice this new discovery brings to light nearly 30 times more frozen CO2 than was previously believed to exist. In fact this particular deposit alone contains 80% the amount of CO2 currently present in the planet’s entire atmosphere. The importance of this finding is how the carbon dioxide ultimately affects the global Martian climate as it freezes and thaws. When the CO2 is frozen and locked away in subsurface deposits like this, it’s not free to enter the atmosphere and do what CO2 does best: warm the planet… as well as increase atmospheric pressure. This means that liquid water cannot last as readily on the surface since it will either freeze or boil away. Also with less air pressure the strength of wind is decreased, so dust storms are less frequent and less severe. When factored in with the axial tilt difference – and thus variations in the amount of sunlight hitting the poles – researchers’ models show that Mars’ average atmospheric pressure may at times be 75% higher than it is today. These shifts in the orientation of the Red Planet’s axis occur on 100,000-year intervals… long by human standards but geologically very frequent. 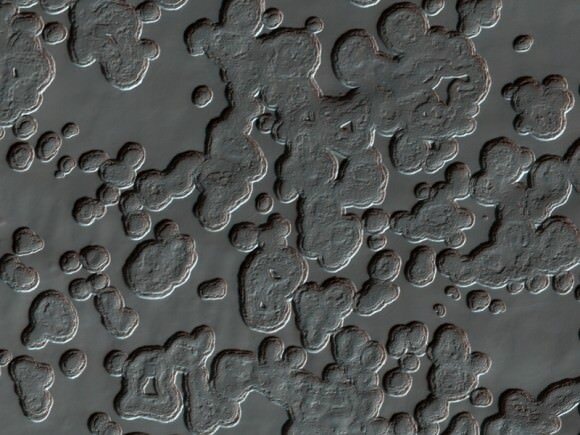 Mars may have had liquid water existing on its surface fairly recently! Although this may sound that Mars has had its own share of global warming due to CO2 emissions in its history, it must be remembered that Mars and Earth have very different atmospheric compositions. Earth’s atmosphere is much thicker and denser than Mars’, so even when doubling its CO2 content Mars’ atmosphere is still too thin and dry to create a strong greenhouse effect… especially considering that the polar caps on Mars increase cooling more than additional CO2 in the atmosphere raises global temperature. Without oceans and atmosphere to collect and distribute heat, the effect of any warming quickly radiates out into space…and eventually the planet swings back into a freeze-dried state. Read the full news release on the NASA Missions site. Originally posted on Universe Today on April 26, 2011.